From X Plus USA. The Return of Godzilla (a.k.a. Godzilla 1985 in the U.S.) Was the sixteenth film in Toho's Godzilla series, and was the beginning of a rebooted series of films, ignoring all of the films from 1955's Godzilla Raids Again through 1975's Terror of Mechagodzilla. The film, which was a direct sequel to the original 1954 film, Godzilla, was produced to coincide with Godzilla's 30th anniversary, and returned the series to the darker themes and mood of some of the early films, returning Godzilla to his old destructive ways as well. 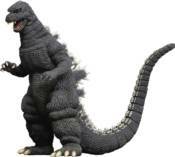 This 12' scale figure captures the Kaiju King's new look from the film.